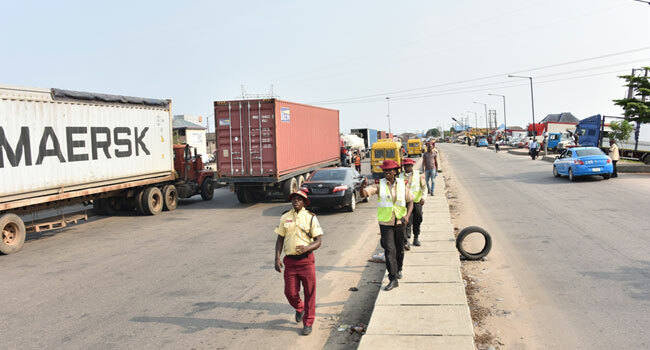 The Lagos State Government has set up a Joint Task Force involving security agencies and stakeholders in the maritime sector to remove all containers trucks and tankers parked along the Oshodi-Apapa Expressway. Tagged ‘Operation Restore Sanity On Lagos Roads,’ the Task Force involve 2,271 personnel drawn from the Police, Lagos State Traffic Management Authority (LASTMA), Lagos State Emergency Management Agency (LASEMA), Nigerian Security and Civil Defence Corps (NSCDC), Federal Road Safety Corps (FRSC), and Nigerian Military including Army, Air Force and the Navy. The Commissioner for Transportation, Ladi Lawanson told journalists on Sunday that the Task Force was able to free the road from Toyota to Mile 2 in an operation which lasted for 72 hours between Friday and Sunday. “What we are doing now are just palliative measures and we have to solve the problem from the source. Even though this is not within the Governor’s jurisdiction but he is adopting a collaborative approach with these agencies of the Federal Government which are the root cause of the problem to look for a medium to long-term solutions in support of the palliative measure that the Governor has started,” Lawanson said. Giving further details on the operation, Commissioner for Information and Strategy, Kehinde Bamigbetan said over 2,000 articulated vehicles were removed from the road including Oshodi-Apapa Expressway, Funsho Williams Avenue and Mile 2-Orile Road and taken to seven designated holding bays. The State Commissioner of Police, Edgal Imohimi, Lagos Sector Commander, Federal Road Safety Corp (FRSC), Hyginus Omeje, LASEMA General Manager, Adeshina Tiamiyu, Heads of Military Formations in Lagos, among others were part of the inspection tour to assess the operation.